The new BugE now comes with different wheel and brake system so someone doing a new BugE build will find some differences. However, these pages may help someone who may be servicing a 2007 to 2009 model BugE. Finally, it's time to run the front brake cables! Since I don't like working in confined spaces more than I need to, I decided to mount the controls on a vise to see how my control stick would go together. Fitting my over sized handlebar clamp, turn signal control, thumb throttle, brakes, brake switches and speedometer was challenging. However, I think it's all turned out OK. The first task was to deal with wiring the rear brake light switches. 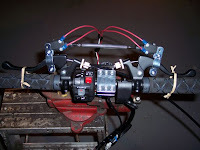 So, I created a wiring section that would allow each handlebar switch (or both) to complete the normally open tail light circuit. I probably didn't need to use a quick disconnect since there are only four screws on both switches. However, not needing to fuss with small screws when installing or removing the control bar will be nice. Before installing the wiring, I wanted to see how the brake handle switches work. To do this, I had a vise hold up the control bar so I could experiment with routing the various wires (including the brake wires), I've removed the speedometer and tilted the brake handles up so the switches on the handles can be seen more easily. To the left is a before photo and to the right is an after photo. The switches are normally open circuit devices. That means when a handle is squeezed, the switch is pulled out and the switch completes a circuit. A spring is used on each switch so the switch isn't pulled out too far. It's a nice idea, however I found a problem with making the switch grip the cable. The problem is that the outside of the cable is too smooth so the little cable clamps cannot maintain their grip. After a few squeezes, I found that each clamp worked it's way up the cable and the switch no longer could be pulled out enough to work. I probably could have added some rubber inserts or perhaps put a small section of stiff tubing on the brake cable prevent the clamp from moving closer. However, I figured there must be a better way. As I was contemplating what material I could use to prevent the clamp from moving, I accidentally found a solution! As one clamp from one cable worked it's way up it's cable, the other one did the same. Then, they then happened to catch each other as they passed. I noticed that the distance between the handles was about one spring wide. So, I decided to try to use just one spring! Now, when both brakes are fully squeezed, the spring creates enough tension to make the switches work without breaking them. After making the wiring tail a bit neater, I was ready to angle the handles forward again, put the speedometer back on and mount the controls to the stick. There is one slight side effect to this. The brakes are a bit harder to operate with the spring that way. So, I may need to find a weaker spring! I decided it was finally time to put on the steering column. However, doing this was not so simple. When I put on the steering column, I discovered the holes that pass through the column were a pinch too high. So, I had to grind off about two millimeters from the end so the holes in the steering column would line up with the existing hole in the chassis steering mechanism. After grinding a bit off the end, I used a rat-tail file to smooth the inside of the tube so it would fit again. Even after lining the holes up, I still had to drill out the bolt hole slightly so the bolt & nylock nut could be installed. None of these operations took very much time. However, all the little delays did add up. The next task was to drill a pair of holes through the fender to reach each brake mechanism (used 1/4" drill bit). 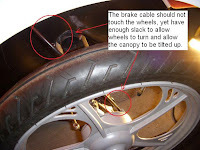 Unlike the rear brake, the full length of the brake cable was used on each front brake. 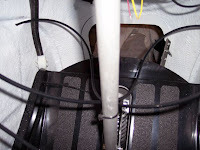 When installed, the cables were installed so they cross over each other and are held in place with a zip tie on the control stick. The result is that the right handle controls the right brake and the left handle controls the left brake. The final (for now) control layout is on the right. The speedometer is back on and the controls have been adjusted to what I think I would like. After the first few test drives, I plan to redo the 12V wiring with what I've learned. I'll be upgrading some components such as changing from thumb throttle to twist grip and upgrading the brake handles to ones that have tail light switches inside them. Since I'll be doing a new wiring harness from the start, according to a component layout that is now known, the wiring should turn out neater. 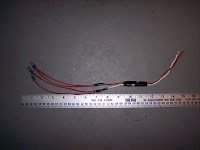 For now, the 12V wiring I have should do for testing performance. After the first few runs, I'll see if any other issues are discovered. (eg. I still haven't decided if I would really use a car radio in the vehicle). Once I have established the final list of must-have features, I'll be developing a new 12V wiring harness that should be quite a bit nicer than what I have now. So, now it's time to move on to other systems. If you have had a bicycle before and needed to tighten the brakes, the process is almost the same on the BugE. All that is required is a proper sized wrench, vise grip pliers and a bit of patience. The cable needs to stretch a bit so expect some back and fourth between the pinch bolt and testing the handle grip. Although adjusting bike brakes is never fun, it is MUCH easier than adjusting automotive brakes! Less expensive too! One thing that concerned me is that front cable sections might eventually work their way into the wheel well to rub against the front wheels. To prevent that happening, I added a low cost electrical-tape / zip tie solution that should prevent any additional cable from moving into the front fender. 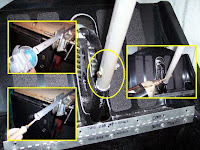 Once the length of the cable permitted in the wheel well is established, put a few wraps of electric tape around the excess cable in the cowl to mark the length. Then add a ziptie to prevent more cable length from working it's way through the hole. 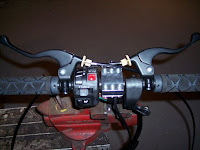 Experimenting with the best way to mount switches to handlebar - 45 mins. Shortening steering tube, re-drilling hole for bolt & installing handlebar assembly - 15 mins. 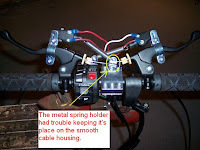 Making handlebar harness wiring - 30 minutes. 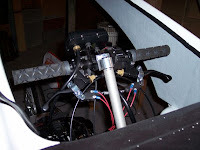 Installing handlebar wiring & tweaking control angles so everything fits - 30 minutes. Blogging - several hours creating this page and revising previous ones.